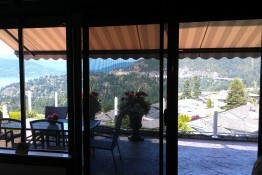 OKANAGAN SHADE AND SHUTTER LTD. (OKSS) is the official Dealer Representative in Vernon, BC for Rolltec®. OKSS is locally owned and operated and you are more then welcome to visit our showroom. Rolltec® has been an award winning and one of the industry leading Canadian manufacturers of high quality retractable awnings since the 1980’s. They have spent the last 30 years perfecting style and comfort in outdoor living. What sets Rolltec® apart from other awning manufacturers is that we produce most of the awning components in-house, using only top notch materials and equipment. With their expansive knowledge and superior product lines, Rolltec® soars above the competition; our numerous awards speak to our products and customer satisfaction. Rolltec® retractable awnings require no maintenance (other than rinsing off the fabric cover periodically), due to the combination of a strong, rust free frame with a self-lubricating mechanism, and durable, water repellent fabrics. Rolltec® retractable awnings are renowned for achieving some of the highest levels of customer satisfaction. We Service the Vernon and surrounding areas for all your Retractable Awning needs. At Rolltec®, we know that everyone has their own styles and tastes in decor so we offer a wide range of products and accessories to suit your needs. Below is a quick overview of our awning models and accessories. For more information on certain products, please refer to the list on the right hand side of the page. For your convenience, our World of Elegance fabric collection is also online. For more information, or to find a dealer near you, please contact us. The ADALIA EXTREME (X3M)™ is our best selling model and can be manufactured in widths up to 24’ with projections up to 11’8”. The slope is adjustable with a hex key and wrench from 0° to 80° and is offered in white, ivory or black as standard frame colours with custom colour matching available. The ADALIA EXTREME EXTENDA™ is a cross-arm awning designed specifically for situations where the projection of the awning is equal to or greater than the width of the awning and is offered in white, ivory or black as standard frame colours with custom colour matching available. 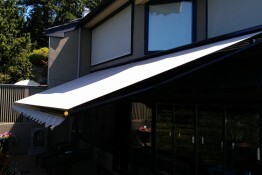 The ADALIA EXTREME PLUS™ awning has uniquely designed adjustment gears incorporated into the arm shoulder, thus allowing for infinite slope adjustments of both arms simultaneously using a hand crank and is offered in white, ivory or black as standard frame colours with custom colour matching available. The BRAVO™ awning is a semi-cassette style awning that protects the fabric from the elements and wildlife. 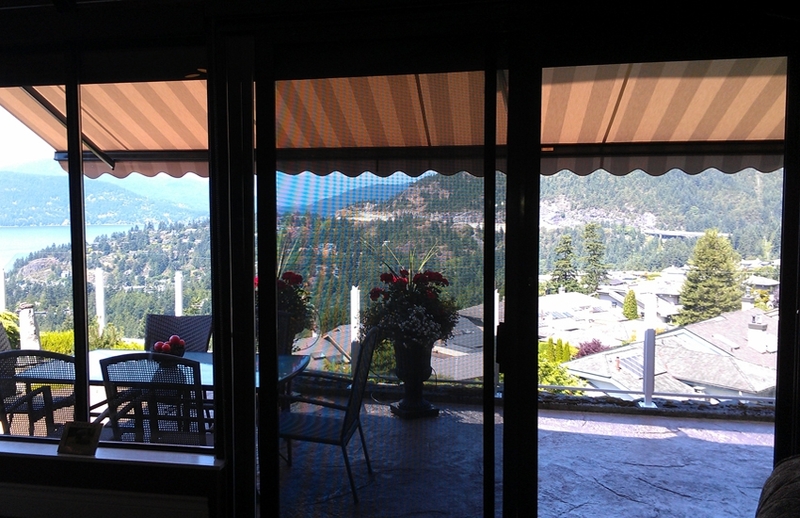 The front bar of the awning retracts into the top and bottom profiles to create an enclosed system. The TILT-O-SHADE™ features arm shoulders designed for independent adjustable pitch, allowing you to raise or lower the front bar when needed. The PHYSIQUE XL™ is a specially designed heavy duty awning system that has been reinforced for added strength due to the 13’ projection it provides; which is the largest projection available in lateral style retractable awnings. Custom widths are available from 15’ up to 24’. The ATRIUM™ awning is a terrace style awning that features a sturdy frame with a retractable top that travels along tracks guided by carriers. Spring loaded legs ensure the fabric is kept taut. The ATRIUM™ comes in sections up to 20′ wide and projects up to 20′ from the wall. These sections can be linked together to create unlimited widths using a rain gutter. The Drop Arm awning is a retractable window style awning with an adjustable inclination range up to 160° by using a hand crank. The Basket awning is a stationary window awning available as 2-rib or 4-rib style. Stationary awnings are manufactured from steel profiles and covered with acrylic fabric. 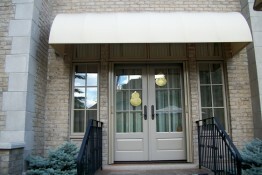 All styles of stationary awnings are custom made to the inch. All retractable awnings manufactured by Rolltec® Rolling Systems Ltd. can be operated manually with a hand crank or by using various electronic motors and controls. We also carry sophisticated weather sensors, protective hoods, multiple sizes of hand cranks, and Spring Assist mechanisms used in large manual awnings. Rolltec® is Sunbrella® SGS Graphic certified so we have the ability to apply vivid graphics and logos or text to our acrylic fabrics. Rolltec® offers our own exclusive World of Elegance fabric collection of 100% solution dyed marine grade acrylic fabrics. This designer collection is available in a wide variety of solid and striped patterns to satisfy any taste and compliment any home’s décor. The World of Elegance collection is carefully selected from leading European fabric mills, which assures the finest quality and exclusive designs for the North American market. The European fabrics are engineered for a lifespan two to ten times longer compared to non-acrylic fabrics such as polyester, cotton canvas that are used in low quality awnings. Our top quality acrylic fabrics in the World of Elegance collection use solution dyed acrylic fibers, meaning the colour is added to the fibers during synthesis, while they are still in a liquid state. This technique locks the colour in, assuring a long life, and allows for easy cleaning. For detailed cleaning are care instructions, please see the fabric warranty. All of our fabrics have been treated with either Teflon or Scotchgard fluorocarbon fabric protectors, creating a barrier between the fabric and the elements. The fabric treatment also reinforces the water repellency of the fabric and keeps it looking newer longer. Thanks to the treatment, dirt does not penetrate into the fabric. The greatest benefit of acrylic fabric is that it provides a high level of protection from ultraviolet rays. It disperses, absorbs, and reflects the UV rays, thus preventing them from streaming through the fabric and making contact with our skin. As our climate changes, so does the amount of ultraviolet protection we need. The length of time we can spend outdoors without any sun protection before sun damage occurs varies between 5-10 minutes for fair skin tones and up to approximately 90 minutes for the darkest of skin tones. The added protection through an awning with acrylic fabric significantly increases the amount of time spent outdoors before sun damage occurs ranges from 30 times longer with a light coloured fabric, up to 80 times longer with dark fabric colours. The amount of protection against UV rays also varies depending on the colour of the awning fabric; light fabric colours will filter approximately 95% of UV rays while dark fabric colours will filter up to 98%. For your convenience, we’ve divided the collection into 8 categories based on their prominent color or style. Feel free to browse the collection by clicking the swatches above. Although we do our very best to ensure colour accuracy, please note that colours may appear slightly different on your computer screen than in actuality. In addition to the World of Elegance collection, we carry the full range of Sunbrella® fabrics manufactured in the US by Glen Raven Mills. 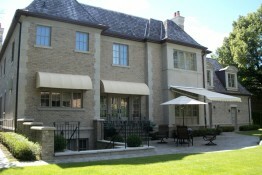 For Sunbrella fabrics, please visit their awning fabric showroom at www.sunbrella.com. 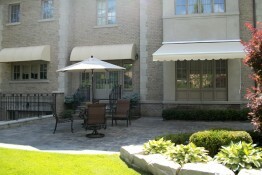 Typically, retractable awnings have to be installed on a flat, even surface. When measuring the width of your awning, please make sure that there are no downspouts, chimney, light fixtures or other barriers in the way (although extended brackets could be custom fabricated to bypass these obstructions). Ideally, your awning’s width should be the same as the width of your patio, deck or existing wall. In cases where the patio or deck’s width is extremely wide (over 24′), it is recommended to either partially cover the area or to have more than one awning installed to accomodate the entire area. For partial coverage, the suggested awning width would be the width of your door or window (or combination of both) plus 2 to 3 feet on each side. Please remember: the greater the width, the better shade you will get. IMPORTANT: The awning’s width is the outside dimension of the frame, not the fabric width. The fabric is usually 5 to 6 inches narrower than the frame. Measure the protrusion of your existing patio or deck and select one of the standard awning projections. Projections are available in 5’4″, 6’9″, 8’8″, 10’0″, 11’8″ and 13’0″ (projection sizes could vary slightly, depending on the model of awning chosen). Please note: The projection of a retractable awning is the distance from the wall down the fabric slope to the front bar, not the distance from the wall straight out. For example: having a 10′ projection installed with a 15° inclination will provide approximately 9’8″ horizontal coverage on the ground. Therefore, if the horizontal coverage of 10′ is critical in your particular application, you might want to consider going with the next available size. 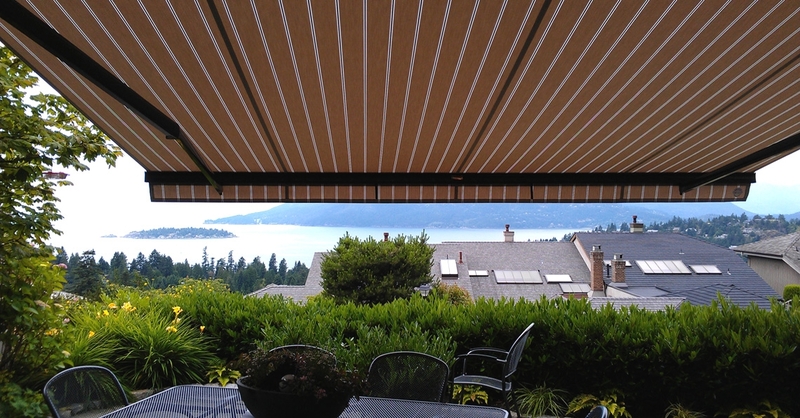 Q #1: Can I use a retractable awning for both sun and light rain? A: Yes, provided that the awning has a minimum 15° slope or greater (20° if the projection is more than 11′ 8″). Anything less will lead to water pooling on top of the fabric, causing the fabric to become deformed (see warranty). Q #2: Do you provide installations? A: Our installation department is servicing the following areas: Toronto, North York, Richmond Hill, Thornhill, Maple, Woodbridge, Kleinburg, Scarborough, Markham, Unionville, Pickering, Stouffville, Uxbridge, Newmarket, Aurora, King City, Nobleton, Bolton, Caledon, Georgetown, Brampton, Etobicoke, Milton, Mississauga and Oakville. Q #3: Is the fabric waterproof? A: No, but it is water-repellent. That means that the fabric will not let water soak through freely, but it will get wet. We recemment that after the storm has passed, it is best to let the awning dry out (2 to 3 hours after a full soaking) before retracting it. However, it is safe to roll up a wet awning for one or two nights, if bad weather persists. Please refer to question #1 for slope requirements in order to use the awning for rain protection. Q #4: Can I use a retractable awning during snowfall? A: No. A few snowflakes, like light rain, will not harm the awning, but unlike rain, snow will accumulate on top of the fabric, weighing down on the fabric and the frame. Q #5: Should I roll up my awning during strong winds? And how strong is strong? A: Yes, you should retract an awning during strong winds. As a general rule of thumb, you should retract the awning when the wind is so strong that you do not feel comfortable being outside. 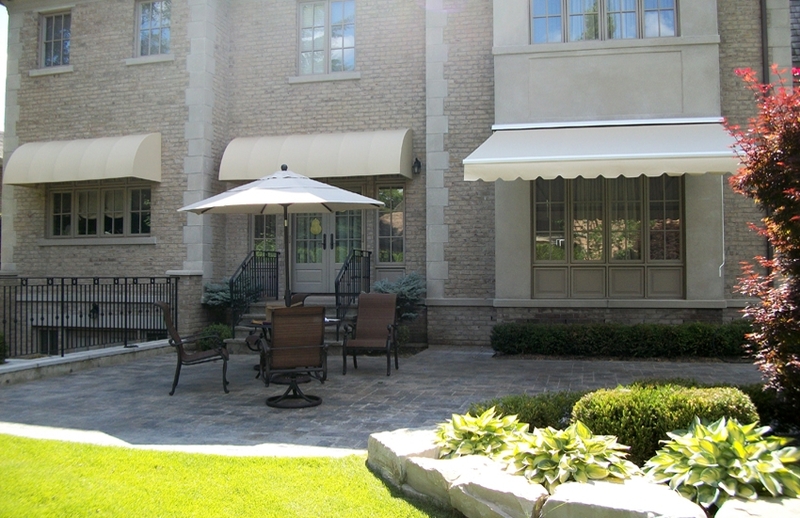 Typically retractable awnings can withstand wind up to 30-35 km/hour. This does not account for wind gusts. Q #6: Can I adjust the slope of my awning after it is installed? A: Yes. The method by which you do it depends on the model. The Adalia X3M Plus™ and Tilt-O-Shade™ models allow you to adjust the slope using the same crank you use to extend and retract the awning. Other models will require a few simple tools for the adjustment. Q #7: I would like a retractable awning but I can’t easily operate a conventional crank. What can be done? A: The easiest remedy is having an awning equipped with a remote controlled motor. In this this case you will have hand held remote which enables you to extend, retract or stop the awning at any intermediate position. There are a variety of other electronic devices available (such as weather sensors etc) with motorized awnings. 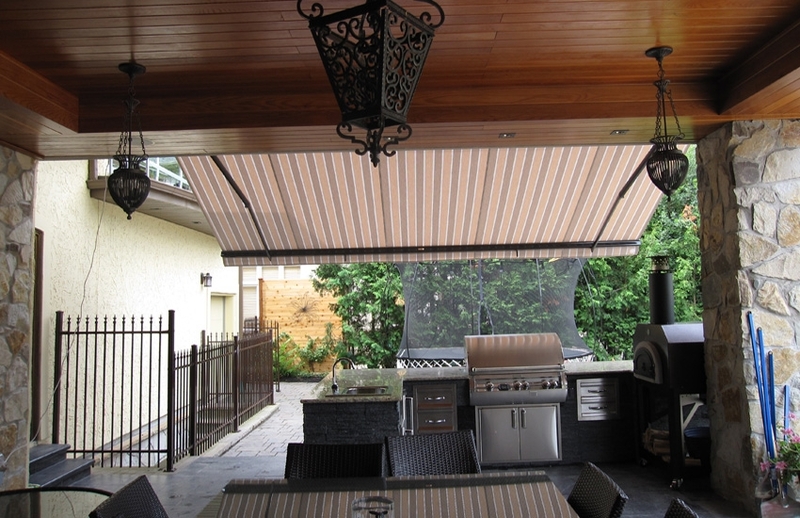 Q #8: I would like to get a retractable awning, but I have limited space where I want it. Is there a way for me tell if my project is possible? A: Call or email us. There are many different ways to install an awning, and we have almost 30 years of experience in figuring out the best way to do it. We will ask you a few specific questions about construction of your house and area which you wish to cover in order to make recommendations. To make things even easier, please take pictures of the location and email them to us. Q #9: What do I do if the fabric on my awning gets dirty? A: Fabric gets dirty, it’s a fact of life. The material can be washed off easily. We recommend that you use mild cleansers and a soft brush or terry cloth (see fabric care section of warranty). Don’t forget to let the fabric dry before retracting it. Q #10: What is the maximum width of a retractable awning? A: The only limit is in the dimensions of your building. By fitting more than two arms, we can make awnings that are well over 20 feet wide. Typically it is recommended to stay within 20 feet wide as a single unit. 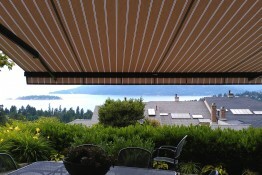 For wider areas you can install multiple awnings side by side. 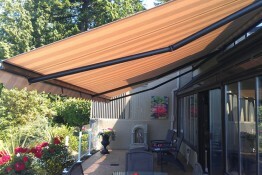 Q #11: Do retractable awnings come in standard sizes? A: The arms (which determine projection from the wall) are limited to set sizes however, we manuafacture the arms in 6 different sizes to accommodate most. Width is custom size down to the nearest inch. 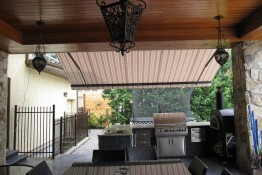 Q #12: Some of the models of retractable awnings on your Products page look very similar. What’s the difference? A: The difference between most of the conventional retractable awnings is noticed in their function rather than their appearance. For example, only the Adalia X3M Extenda™ will give you an awning that is longer than its width, only the Physique XL™ uses 13-foot-long arms, and only the Tilt-O-Shade™ will let to you adjust the slope of individual arms using a conventional hand crank. To find out which awning is right for you, visit Our Products page or contact us. Q #13: Can you print text or graphics on the awning fabric? A: Yes. In fact, we are certified to use the Sunbrella Graphics System for high-quality, consistent results. Q #14: If something happens to my awning after the warranty has expired, can I replace just the part that broke, or do I have to replace the whole awning? A: Depending on the part and the damage sustained it can be replaced. With more severe damage, a new awning might be recommended. Please read the warranty for terms and conditions. Q #15: So how much does it cost? A: There is no quick answer as each awning is custom made to suit your needs, as well as factoring in all the various options which determine the cost. We will need to ask you some questions before we can give you a quote. The best way to obtain a proper estimate is to arrange for a free in-home consultation with our field represantatives. If you are outside our service area please contact us. Q #16: How much sun will be blocked? A: Approximately 95% to 98% of the sun’s rays are blocked. The tightly wooven acrylic fabric allows very little sun to penetrate the fabric cover. Q #17: Can you do window or door awnings too? A: Yes, absolutely. We manufacture several models of window and door awnings. Please refer to our products page. Q #18: What is the difference between a high quality ROLLTEC® awning and someone else’s? 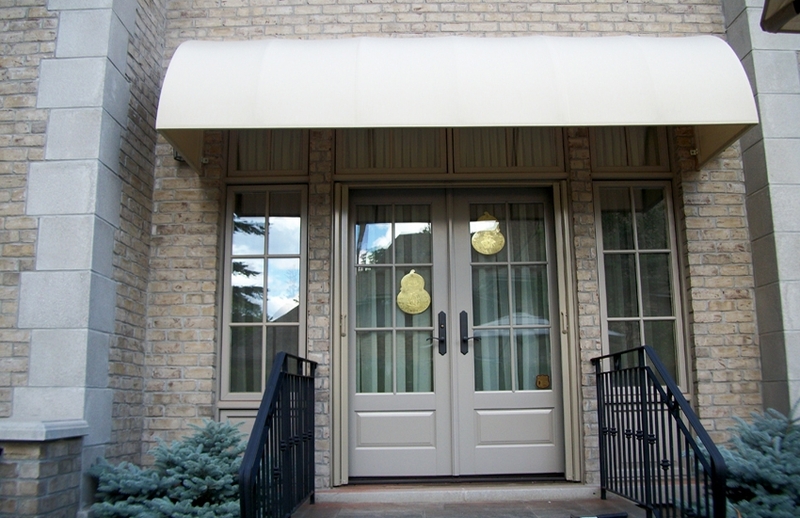 A: We produce most of our awnings’ components in our factory located in Concord, Ontario, Canada. We use only top quality materials such as extruded aluminum and stainless steel. Furthermore, to assure we retain the highest quality standards, we use computerized sewing operations, which provide flawless stitching and seams on all awning fabric covers. Our on-staff engineering team is continuosly designing and perfecting all aspects os awning technology.